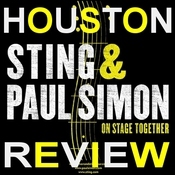 Paul Simon and Sting apparently meant it when they decided to title their joint concert tour On Stage Together. 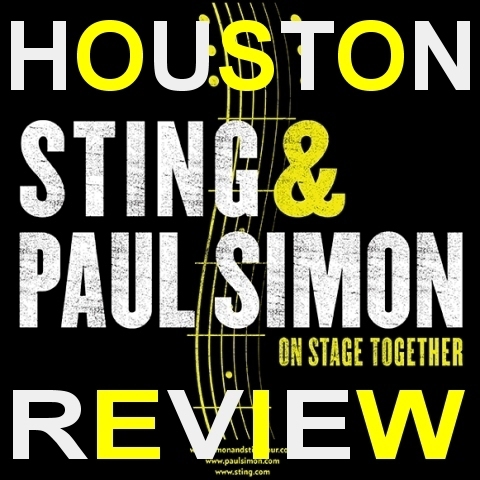 On opening night at Houston's Toyota Center the two veteran headliners spent plenty of time in each other's company, standing side by side for 10 of the two-hour and 45-minute show's 30 numbers - a fairly seamless collaborative endeavor more akin to Billy Joel and Elton John's Face 2 Face programs than the typical joint billing. Moreover, their two bands - a combined 14 musicians - melded and intertwined throughout the night, adding richness and nuance to the song arrangements. The evening – which Simon introduced as "our experiment melding two bands, two styles, two catalogs of songs" - started with a trio of collaborations, Sting and Simon walking on to the buoyant strains of the former's "Brand New Day" before bouncing into Simon's "Boy in the Bubble," trading lead vocals on both. "Fields of Gold," meanwhile, was a duet tailor-made for Simon's gentle timbre. 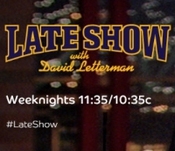 Later on the duo worked their way through a reggae coupling of Sting's "Love is the Seventh Wave" and Simon's "Mother and Child Reunion," while duets on Sting's "Fragile" and Simon & Garfunkel's "The Boxer" were effective segues between the individual sets, the latter bolstered by the distinctive grit and husk of Sting's vocals - and earning Simon a kiss on the forehead from his ebullient tourmate. The encore brought another three-song, full-ensemble combination, including energetic versions of the Police's "Every Breath You Take" and Simon's "Late in the Evening." And Sting brought another variation to Art Garfunkel's definitive parts to the closing "Bridge Over Troubled Water," complementing the majesty of Simon's melody with an assured fan's delivery rather than trying to compete with or reinvent Garfunkel's showpiece. Sting and Simon's own sets didn't pale next to the collaborations, either. Both wisely offered up plenty of hits, with Sting and company rocking through an extended version of the Police's "Driven to Tears" as well as the band's "Every Little Thing She Does is Magic," "Message in a Bottle" and "Roxanne," while "They Dance Alone" and "Desert Rose" were beefed up by the expanded instrumentation from Simon's band members. Sting also offered up his own version of Simon and Garfunkel's "America," explaining that the song reminded him of when he first came to the U.S. with the Police – then chiding the wave of cheering when he mentioned the group's first show in Houston; "Don't say you were there. There were three people there, and two of them were roadies." Simon, meanwhile, mined his solo catalog during his own sets, and while favorites such as "50 Ways to Leave Your Lover," "Me and Julio Down By the Schoolyard," " You Can Call Me Al" certainly brought the crowd to its feet, deeper tracks like "Dazzling Blue" and "That Was Your Mother" were welcome inclusions. And he also scored with medleys that melded "Hearts and Bones" with Junior Parker's "Mystery Train" and Chet Atkins' "Wheels" and "Kodachrome" with "Gone At Last." It was an "experiment" that succeeded by any measure on opening night – and will likely keep improving until the tour wraps on March 16 in Orlando. For more reviews from the Houston show please visit http://www.sting.com/tour/date/id/2912 where you can view the setlist, leave your comments about the show, post images of your ticket stub and your photos from the show!